guesting | Kris + Books = Good. *Sometimes*. This entry was posted in dik, guest blogging, twitter. Bookmark the permalink. Wow. You're good at that. How about Gone With the Wind? I accept your acknowledgement of my awesomeness. Of course, since reading an entire book to review it in 140 characters or less seems like a lot of work, you'd have to just choose 140 random characters from the book on which to base your review. I assume you mean 'characters' and not characters cos, seriously, if a story features 140 characters, regardless of whether their secondary or not, I ain't reading it. Having said that, I did read the LoTR series. 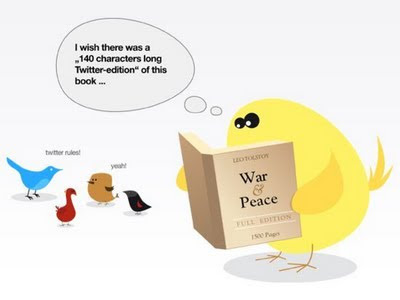 I reckon the battle scenes would definitely cover the 140 characters thing. Have you noticed how Chris is just trying to distract you away from the whole topic of who isn't on Twitter? You should Tweet a whole range of books & you're sure to be published. Imagine the whole 645 BDB books in less than 140 characters. I'd read more of the series then. I would be up for tackling the BDB. I could do a whole series of book summaries in 140 characters or less. Chris: I am always correct. That would be the correct in being right sense cos, god alone knows, I'm definitely not proper. You're DIKing! I'll be there! Or the future Qhuay novella?